Many have said this is "Healing Music" to them and the artist takes that as a very high compliment. 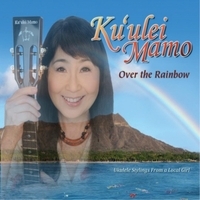 She wants everyone to know that her music comes straight from her heart, me ke aloha ("with love" in Hawaiian), and hopes that everyone will enjoy listening to her music as much as she enjoys sharing it. It took four-and-a-half years to make this album as it was done completely on her own and she is hoping that this first solo ukulele album will do well enough so she can churn out a second one that won't take as long the next time around! She sincerely wants to thank each and every individual who purchases her CD, for their kind support. Great showcase of Kuulei's unique and contemporary ukulele style. She has a beautiful voice too! Stylish mix of standards, top 40 and Hawaiian with impeccable attention to detail, nuance, and refreshing twists to familiar tunes.